Last week Philip Duke (@philipdukeclimbing) did the first ascent of his long-standing project in Electric Mountain in the Wicklow Mountains. 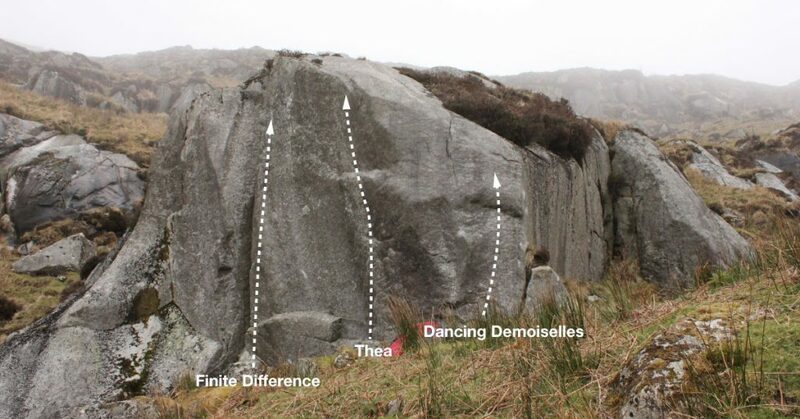 The tall granite boulder (https://goo.gl/maps/mUe2fZTh9Po) stands at the back of the corrie above Lough Nahanagan just off the Wicklow Gap road. Thea 8a tackles the right-hand side of the leaning wall starting with a few set-up moves on small edges lead to the crux dyno to a slopey ledge before finishing with a high topout. I asked Phil a few questions to find out more about the problem which much be up there with the best lines in Wicklow. 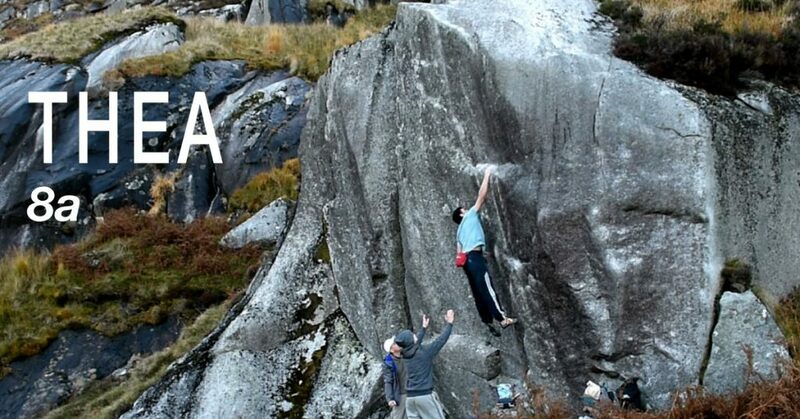 Check out Phil’s video of the ascent Thea FA 8A from Philip Duke on Vimeo. How long have you been trying the problem? How many days did you spend on it? I started trying it over two years ago, on the 30th June 2016. I remember because that’s my brother’s birthday. I had cleaned all the holds that I could reach just to see if it was possible. It’s obvious a dynamic move from looking at it but I didn’t know how to go about it. I‘ll be kind to myself and say it was about 25 sessions, not including the training sessions doing a replica on a 30 degree board. It took me 3 sessions to do the top on a rope, it’s not hard, just high. I’m not used to being 25 feet off the ground (typical boulderer). I wasn’t used to hanging from a rope and was nervous trying the top moves for the first time. In the earlier sessions, I’d try the jump, then clean the top part a little more every session. It became more and more real then. There were some days I got rained off just after a warm up and wouldn’t even get to try it. Has anyone else been on it? I know you have been up there with Dave Fitz? A few of the lads have been on it, I wanted to bring stronger lads out so I could learn the move from them. Dave Fitz, Daragh O’Connor, Adam Ryan and Paddy Nolan all gave it a go. They’re all good at these dynamic moves and I learned a little bit off each of them which helped a lot. The left crimp (about 8mm) isn’t as good as the right. 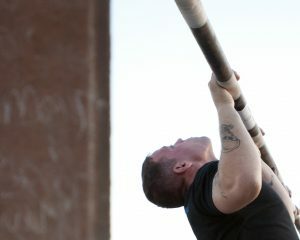 In the earlier sessions I was trying to latch the jump with the left hand. I tried that for 12-15 session until Dave tried it with the other hand and almost stuck it. I tried his way and felt it could work so stuck with it. I just needed to believe I could hold the left crimp and he showed me how. Could you talk me through the moves? Is the dyno the crux, what’s the topout like? Yes the dyno is the crux, it’s a peculiar one though, not your typical dynamic move where the more power you use gets you to where you want to be. There’s a lot of core tension and understanding what positions your limbs have to be at certain times. I could get more scientific with it, but I won’t knowing that some young lad will just rock up and flash it someday and all my knowledge of it will be pointless. Treat it more like a dead point move for the first half of the move and then put the power down for the second half. Try not let the left hand pop. The top out is ok. 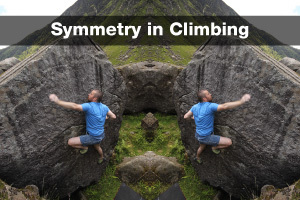 There is an easy sequence you’d want to learn if you’re a bit iffy with heights. I think if you get to that point after doing the dyno you’ll be fine. There’s one balance move that I was worried about just after the mantel, but it went smoothly on the day thankfully. The slopers are positive at the top and there’s a good foot you need to find just before the cross over move. After that you’re done. Did you work it on a rope? 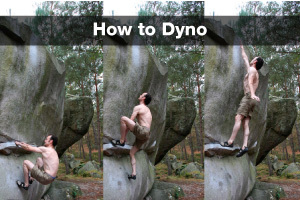 Did you do it first time you stuck the dyno? Any big falls? Landing is good right? Yeah I had 3 sessions working it on a rope and a few more cleaning it. I got used to hanging around up there and enjoyed it, knowing it would all come together someday. The first time I stuck the move was about 2 hours before I actually sent it. I was on my own trying it. I had come to a point where I understood what needed to be done and felt confident it would happen. I remember hitting the sloper and then not hitting the pad, for once. It took a few seconds to register what was going on. There was not scream or immediate excitement. The problem was I didn’t plan for the top out that day. I hadn’t practiced those moves in over a year. I got a really bad injury last October which led to 2 more injuries. So all in all I was out for 8 months. I could climb, but not hard. In a way it was a motivating factor to train wisely for this season. I vaguely remembered the moves to the top, I was alone. I had no one to move the pads or encourage me. I enjoy climbing alone but its times like this you realise how much confidence you can get from having your friends around. I spent a few minutes hanging around on the slopers just before the mantel. I felt my arms draining and jumped off. There was a combination of shock, bad planning and fear that made me jump off. I spent a few minutes on the pad with a lot of thoughts going through my head. If you see the start of my video you’ll see how I felt. The biggest one was knowing it was doable, but I was annoyed and upset that I didn’t plan it through. I thought who’s the nearest person to Turlough Hill? I rang Jamie Mulhall in Blessington, he was the nearest, he wasn’t available. Shite. I must have rang everyone in the end. 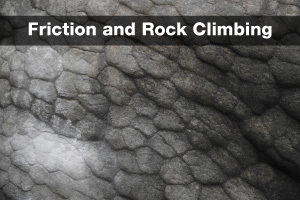 I sent a message to the Dublin Climbing Centre whatsapp group. Ian Gaffney got back to me within a few minutes. I’m thankful that he came out to me. He brought Jakub along and a few extra pads. They’re both relatively new to climbing and were excited to be in a new area and climbing rocks they never climbed before. I warmed up with them. Their enjoyment calmed me down and allowed me to focus again. I spent a few minutes visualising the moves and then stuck it the very next go. It was a bit surreal topping it out. It’s always easy in the end. I don’t care how long it took me, I learned a lot about myself as a climber and a person from it. The fall zone is safe enough, I did hit my face off the rock behind somehow on one attempt. It was a freak landing, other than that it’s pretty decent. With pads and spotters you’ll be grand. 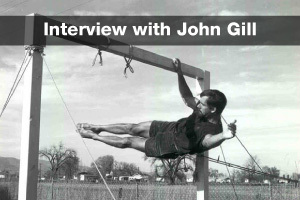 For me it’s almost the perfect problem: the line of least resistance up a big face, tall, good landing, dynamic. Considering all this and the fact that it’s pretty obvious and only a few minutes from the road why do you think it’s remained unclimbed for so long? I know a few people have looked at it before and you’d have to ask them why the never wanted to try it. For me, I had time on my hands and was starting to get into developing and putting up first ascents, especially around Turlough Hill. It is addictive working a block no-one’s ever touched before and then doing it. I enjoy the feeling of creating something out of nothing isn’t something you get to experience too often. Being able to visualise moves without any prior knowledge is a skill you quickly learn when cleaning up a rock. I’d encourage anyone to do it. It helps create a tougher mind-set when it does come to project time. If you take the location into account you may think there would be access issues due to where the block is. I’ve been stopped and ask a few times up there what I was doing with a mattress on my back. I think I may be invited to this year’s X-mas party I’ve been there so much. It’s a cool place to be and access is allowed. Another factor may be the height. It 25 foot (7.5m) at its highest point, it may not be high enough for a serious injury, but still, you don’t want to fall. 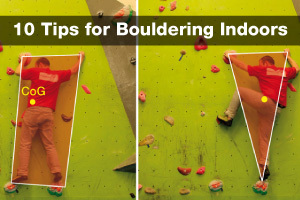 I think with the increasing numbers of climbing walls opening in the last few years, climbers gravitate more towards the indoor scene. It’s more social, warmer, and you get your fix quicker indoors then you would from sitting under a boulder only trying to attempt moves every five minutes or so. The rewards are far greater outside though. Working on anything else interesting? I’ve had a great start to this season, I did some Glendo classics during September and I felt topping out five or six problems I’d never done before gave me a lift when it came to sending Thea. Two weeks before the send, I did Afro Left Sans Block. It was almost out of the blue but my confidence sky rocketed from it. Doing Afro is making me keep my options open to never write anything off and not to get so caught up in just one boulder. During some of the September sessions I tried Leftism. I had all the moves done and did a few nice links. I’m starting training from that now and plan to get it done this season. There’s a few classics I want to finally do too. There’s also the “The Secret Roof Project” in Turlough Hill, that’s not really a secret anymore. 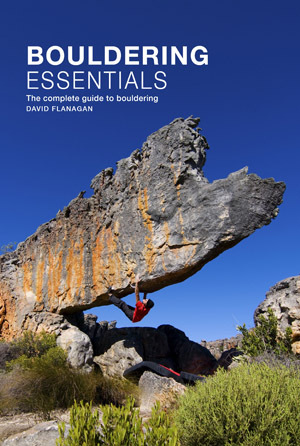 It’s a 3 move boulder from a strange stand start position. I haven’t figured out the second move yet. I think I’ve had 5 sessions on it now and did the first move last week for the first time. There’s possibly a sitter to it which I’d like to see get done sometime. 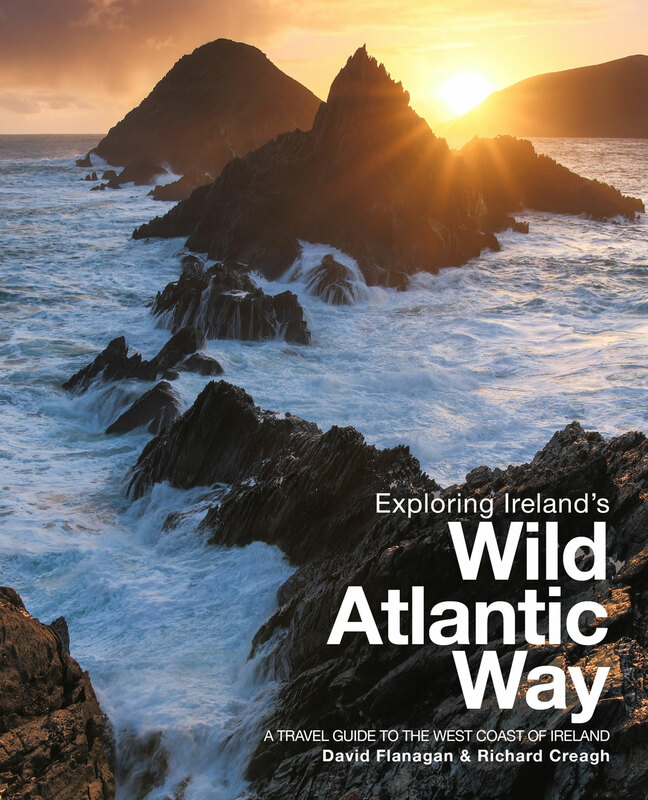 I think that’s one for some of Ireland’s finest though. I can’t see a way. 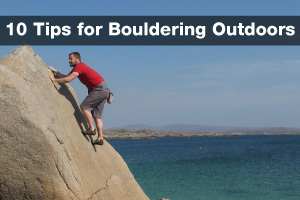 Some other boulders on my list are Hightech-Funk in Mall Hill and Intergalactic in Glenmalure. I had one really good session on each. HTF is a tricky slab, which suits my style. Intergalactic has one of the coolest moves I’ve tried and the setting is incredible. Depending how Leftism goes I’d like to get back on them this season. Left arrete of bigest boulder in sight. 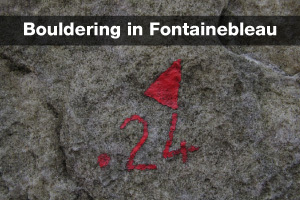 Maybe 6b but with height+landing 6c ish.